Flu hit me Monday. I almost have no memory of the first two days, just some strange dreams and random, chaotic thoughts. Thursday my head cleared up a bit so that I could think about my next blog post making notes on a piece of paper ( I was too weak to open my laptop). The misery of my condition couldn’t produce anything cheerful, and somehow I started thinking about all the innocent creatures of this world who’ve got to suffer for nothing. Goats came to mind. 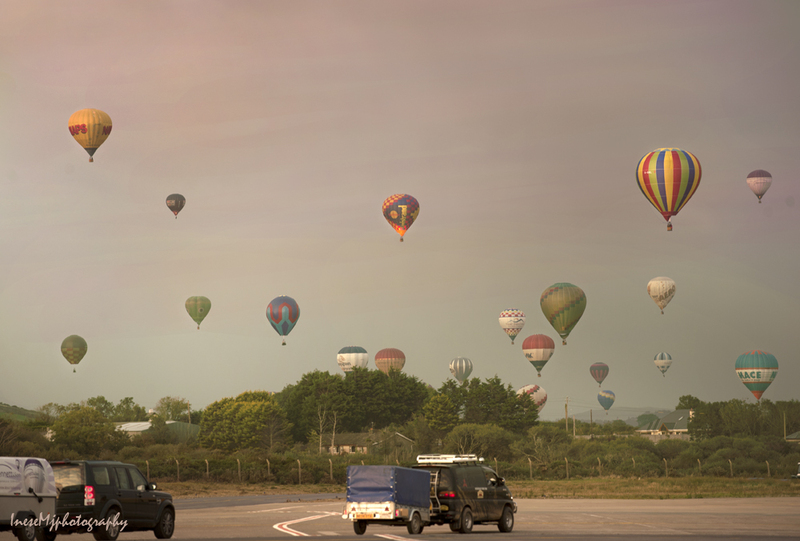 My first image was taken on a bright summer morning during Waterford Hot Air Ballooning Championship . I got a few good shots at the take off in the grounds of Waterford Castle, and was on my road to Passage East where I expected to take a ferry and cross to Co Wexford. I was almost there when the events took a rather surreal turn and the scene changed to somewhat apocalyptic in a matter of seconds. The goats. They started falling out of the thick bushes, off the almost vertical cliff – all sizes, shapes, genders and breeds. The sun was blinding me, but true to myself I was pressing the shutter. Two cars in front of me navigated out of the scene when more goats jumped from above, not less than a hundred of them, and I was stuck. I missed the ferry, but took a great set of pictures. 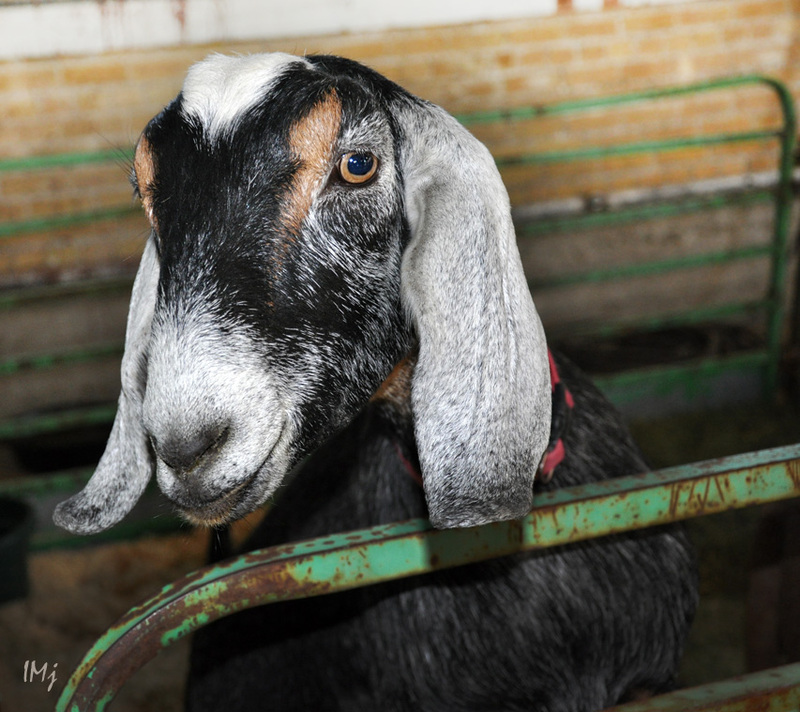 Goat is one of the first domesticated animals. When and where he ruined his reputation, is not clear, but he is associated with the satyr Pan, notoriously mischievous god who had a long beard, goat legs and horns. Read this article, it is very informative and amusing. Pan was so ugly that even his mother run away from him horrified and disgusted. It is where the word ‘panic’ came from. I don’t know what to say, but look at these pictures and prove to me that this goat is not a saint among his people. Some goats have a better fate. The picture below was taken ten years ago, in Killorglin, Co Kerry. 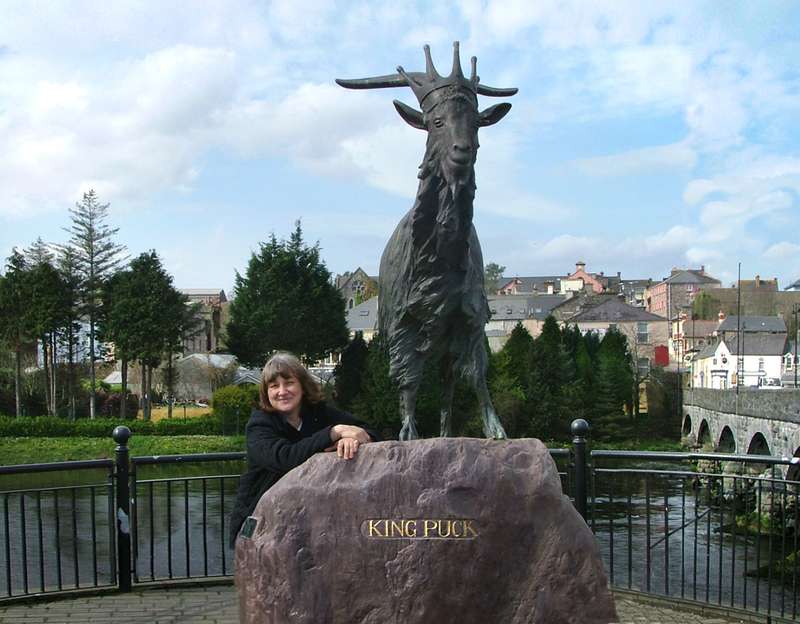 Every August people gather to celebrate Puck Fair in Killorglin, and a goat is crowned to become a king of the land for three days ( you can watch a video on this link). The earliest known reference to Puck Fair is a charter by King James I, dated 1613, granting a legal status to the existing fair. The farm hands had a clause in their contract to be free of work for those three days. The festival is a great event, and I hope to attend it some day. If you travel Ireland around 10 – 12 August, make a note. 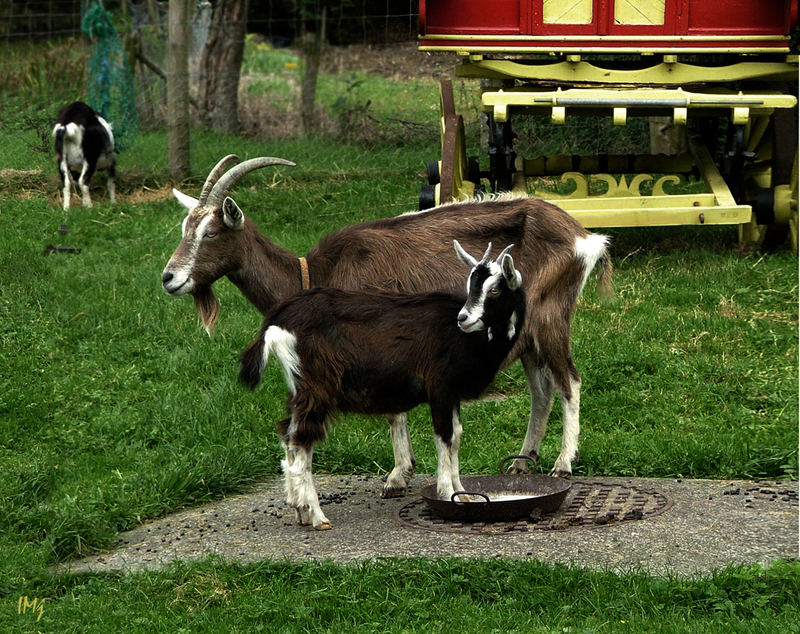 These skinny goats were spotted in Bunratty Castle, Co Limerick. 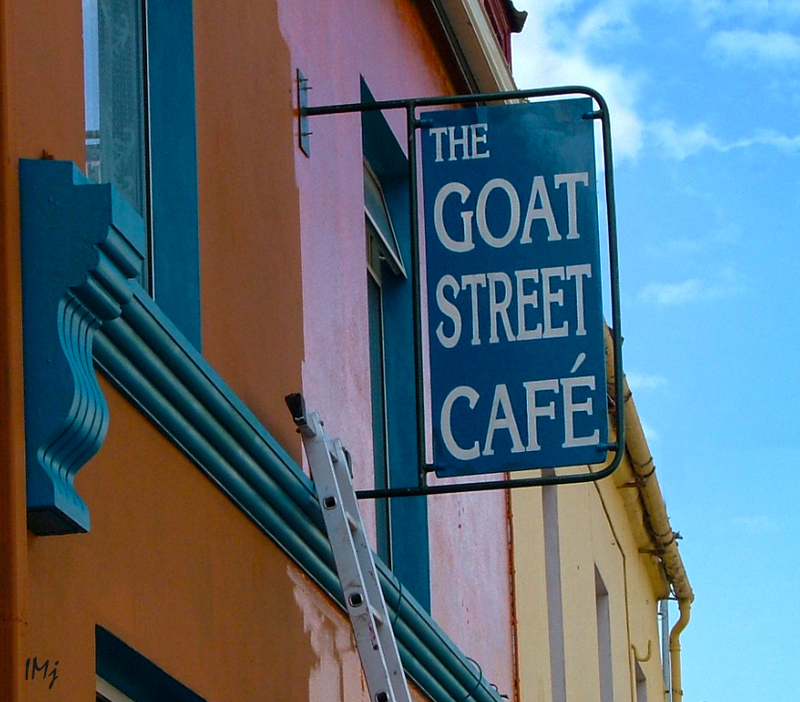 Co Kerry has a weakness for goats – in town of Dingle, Goat Street is an extension of the Main Street. In the Shakespearean tragedy, Iago works Othello into such a state of jealousy, that the poor man imagines things that have never happened. He exits the scene with the exclamation ‘Goats and monkeys!’ using the name of innocent creatures to express his disgust. I do entreat that we may sup together. You are welcome, sir, to Cyprus. Goats and monkeys! 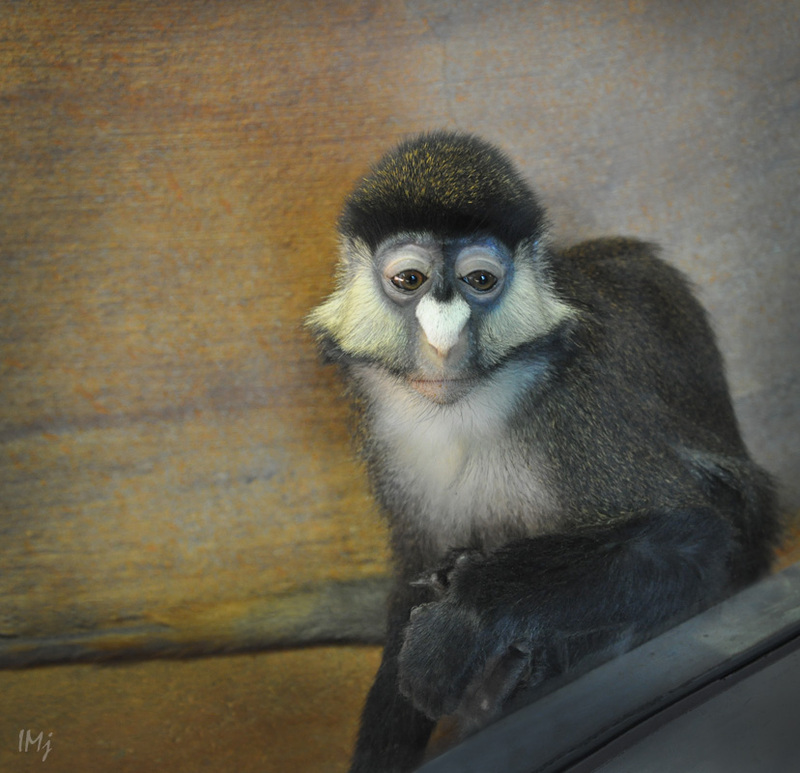 Using Desdemona’s words, I can tell that, concerning goats, “… I have spoken for you all my best “, and now I should speak for monkeys too, which would be only fair. Look at the picture – this face speaks volumes. Don’t judge monkeys! The Hot Air Balloon Festival ended with amazing take off from Waterford Airport, but I will remember it because of the Passage East goats. I do hope I have been a good advocate for the creatures not favored by some. What if we change the tradition and make “Goats and monkeys” a funny exclamation, not a symbol of immorality? It is the 21st century, after all. Happy Christmas to you all, peace, love, inspiration and joy! Thank you so much for so perfectly recognizing my hidden message, Randall 🙂 I put this photograph on hold for the end of the year. I took almost all the pictures through the windscreen, and the colors are as taken, but the lens flare and dirty glass ruined a lot of shots. This one is a composite. 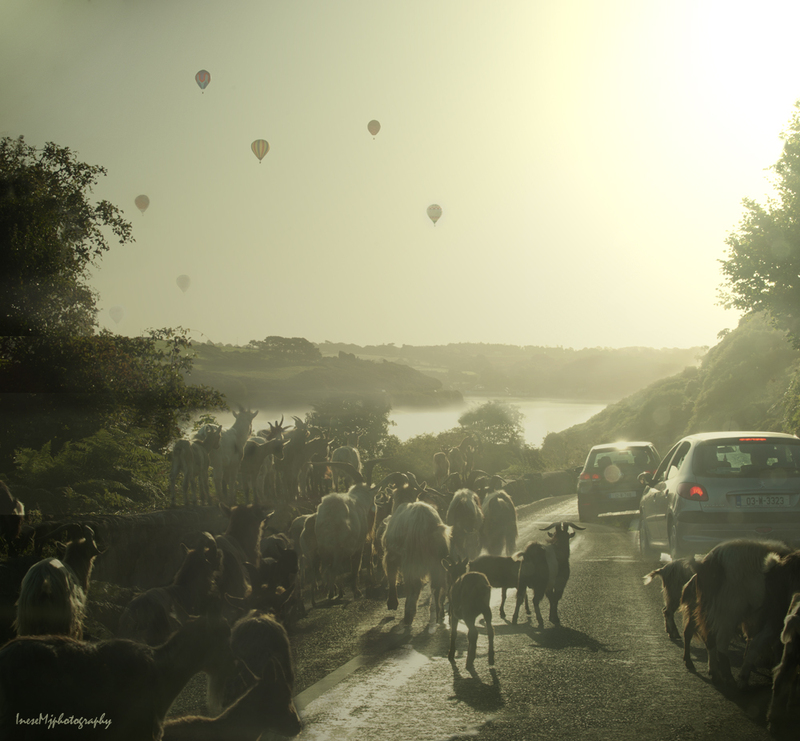 Still, it doesn’t show the moment when my car was actually surrounded with a sea of goats 🙂 The balloons were floating away; the goats were coming down like the creatures of hell; the drivers behind me were impatient; I was shooting everything in my sight, knowing I won’t have another chance like this. I remember your post about the goat – I have read it more than once. Your experience was like a personal revelation, illustrated with your outstanding photographs of the messenger :). I like almost all animals and particularly think goats can be gentle if raised by gentle people. I have seen monkeys but dont really “know” them. 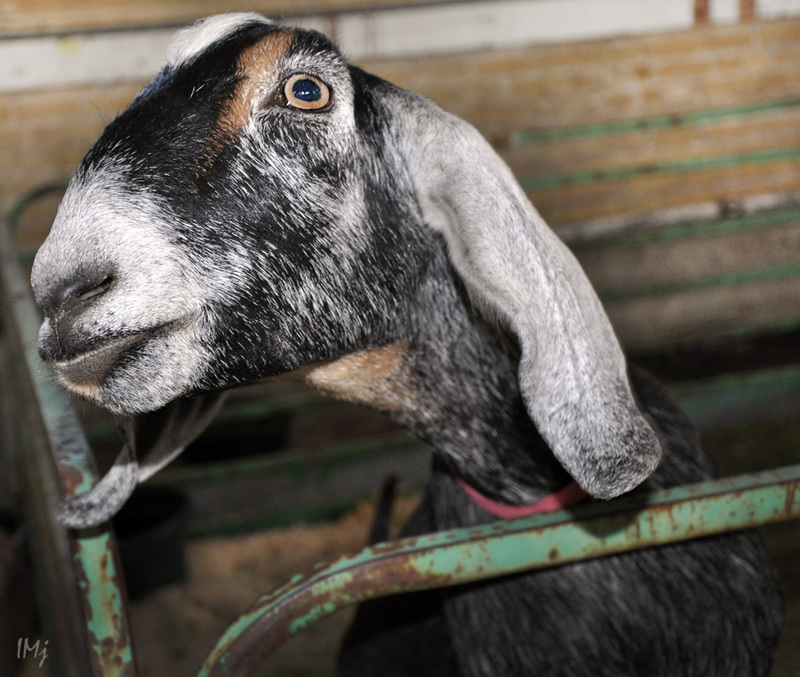 I do know goat owners, farmers and families who raise them for milk and to make goat cheese. I believe we are supposed to be good caretakers so I won’t make fun of these creatures as you asked us not to, Inese. Hugs and happy wishes for your 2016. Happy and creative New Year to you!!! I do like the balloon pictures. I has nice mood to it and I love the pictures have many of them. I went to the occasion once but there were only few of them and most of them were just on the ground. They were very colorful though. I hope you are felling well now. Thank you Phil! Best wishes to you and yours! Hope for a great New Year. I’m sorry to hear that you’ve had the dreaded flu, Inese. I’ve had it once in my life and really don’t want it again, so I know how you must have felt. I’m surprised you managed to write a post at all, yet you’ve written this really interesting one. I’ve never really thought a great deal about goats before. I’ve always liked them, and never thought them to be ugly, but I’ve never delved into all the stories about them. I’ve seen pictures of Pan depicted as a goat, but never connected him with the word ‘panic’ – very interesting. And the next time I visit Ireland, I’d love to see the Puck Fair (I’ve noted the dates). From the links you added, it looks like a lot of fun. The story about the goat and Oliver Cromwell is interesting, too. Cromwell’s activities in Ireland are well documented! Thank you for very interesting post, Inese. Look after yourself and have a wonderful Christmas. Millie, thank you so much for your kind words! Flu can be very dangerous, and staying in bed for a couple of days can save lives – my own experience, and I never neglect this part since. There are two festivals I want to attend – Puck Fair and Ted Fest. I always miss Ted Fest because it is booked out before I even think of going. Have a wonderful Christmas and a safe and peaceful New Year! Love the images. I hope you are in full recovery. Also love that goat cafe. Smiling so hard. Thank you, I am feeling much better. Great. You have a great eye for photography. You always take lovely images. I need to do that. Smile. Really enjoyed these photo. The goats are so cute, and those balloons just spectacular. Happy Christmas to you too! Thanks for the follow. You are welcome, I love your blog. Sending you good thoughts to feel better very soon. That was a fun post. Who knew there was so much to goats? I’m glad to hear from your last comment that you’re feeling better, by the way. Glad you’re feeling better! Fantastic set of images. Thank you so much, Karin! Glad you’re feeling better!! I love goats, they are such a amazing creatures! Thank you! Aren’t they lovely, smart and brave. Well done for taking those photos, in spite of the flu. I love goats too. You took some lovely shots of them. There’s a Puck’s Castle in Shankill, county Dublin and it’s supposed to be haunted so I think it was called that from the Irish word for ghost – púca. So as usual, I am so impressed with the images! You are a great photographer! Glad you are feeling better! Thank you so much for your kind comment! I am feeling stronger every day. Hope you are well on the mend. Love your post. Passage East is certainly a place to behold! Dear Inese. I saw this in my email last night and have been trying to get here ever since — I’m so sorry to be late, when you were sick. It’s so miserable and frightening to be so ill and weak. I hope you are feeling much better (though it sounds like it might take more than a couple of days). I’m impressed that you did such a good post knowing how badly you felt. I’ve always liked goats, so curious and they have such gentle faces. In the rural southeast some people keep them (and even loan them to friends) because they can so nimbly nibble the grass away from fences. As you say, some are treated better than others. I hate to hear of any animal being mistreated. Teagan, thank you so much for your kind words! I am still fighting bad cough, and feeling weak, but the worst is over. King Puck is the most favored goat for sure, but I love all his clever and funny relatives wherever they live in the world. Have a beautiful holiday season, with some magic and nice surprises. Sending you many hugs!!! Thank you so much, Olga! It is only my second day on my feet, but I am feeling better. Aren’t they wise and brave animals? Oh my darling, get well. there is nothing worse, especially at this time of year too. I did love this post. When you feel better I will tell you why I am known on Tilos as the woman who dances with goats…. Thank you! I am slowly getting there. The balloon picture is magical. Many thanks! Thank you! I am so sorry, I cannot get back to your blog. Could you please give me a link to your page? Lovely pictures, glad to hear you’re recovering. Thank you so much! I was lucky to have a time off. It helped a lot. Hope you feel better soon Inese! I use to have a goat. I loved it. They are cute! Thank you Seb, I am improving. I wish I had a goat! I love them. LOL 🙂 It shows that often the less obvious photos are the better ones! Sorry about your flu, dreadful thing to have. I love the pictures, especially the ones with the goats. Wish you a lovely holiday season! Thank you! It is what they say, the ‘panic’. Makes sense. Oh thank you so much! 🙂 I am getting there, just slowly. Viruses are such a nuisance. I loved your post, as always. The photos were sweet; especially of the goats! Hope you are feeling better now. Lovely photos and nice narrative. I didn’t know the origin of “panic”, so thanks for that too. Thank you so much! Glad you like the post 🙂 I am still feeling unwell, coughing. Cannot sleep – it is 3.45 am here 😦 Hate flu! My son has been ill with the flu this past week (his third bout in as many months), so reading your post, I thought of how ill he’s been and I do really feel for you. Take care. I hope the cough goes quickly; that really is the enemy of sleep. Thank you, and so sorry for your son – it is a true misery 😦 Cough will stay longer. Human weaklings, it is all we are. Viruses are stronger than us. Thanks Ines. He’s bounced back in the way of the young. You’re right about human weaklings; and I worry that we don’t exactly help ourselves in a society full of fast food, inactivity and environmental toxins. And on that cheery note … Happy Christmas. Happy Christmas and a healthy New Year! Thank you so much, Sheldon! Have a lovely weekend! Extensive lab studies have been made on rats proving they have empathy and will rescue other rats who are confined. They are also smart. Animals have abilities we don’t want to know about because it would change the way we treat them! I hope you feel better my friend and Happy Holidays! Thank you so much Cindy! I agree with everything you are saying. Away with all the unkind traditions! Happy Christmas! Thanks for standing up for us goats! What about the mountains? May be there are some wild goats? Goats aren’t in the Peruvian ecosystem, we have in the mountains llamas, pumas, condors, and other animals but not goats. It’s strange but seems like Spaniards didn’t bring them. It is amazing – you haven’t mentioned sheep too, do you have them? Happy Christmas to you! I totally love goats & monkeys, and they are 100% beautiful, positive and fun making. Thank you! 🙂 Happy Christmas! People say, “Rats,” the same way. Where is the rat love? We used to have pet rats. They are loving, intelligent animals, seriously. I knew that. They freak people out, but they’re really smart and adaptable. Nubian goats are my fav. I do like other farm animals but goats capture my attention. I do have a penchant for miniature goats they are so cute and you can take them home in your pocket. I have seen hot air balloon contest and just for plain fun rise to the heavens. So colorful. Thanks for this interesting post. Thank you so much! I too love goats, and I think they are very wise and modest creatures! When I saw the title and that you had the flu, I thought you had fever induced hallucinations about goats and monkeys. I recall seeing some goats (and many sheep) when we visited Ireland. Love the images. Cheers! A very entertaining post! I’m amazed you were able to pull it together! Bravo – take care and have a healthy, happy holiday season! Thank you so much Jan! Enjoy the holidays!